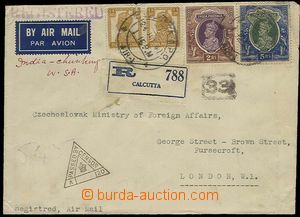 1947 airmail letter to Czechoslovakia franked with. from both sides envelope/-s 28 pcs of zn.(! ), i.a. 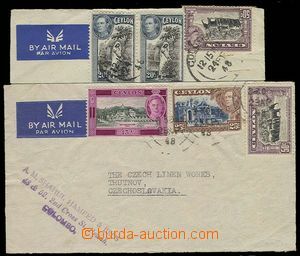 Mi.651, 768, 769, 632 and other overprint and air-mail. Posting CDS Shanghai 29.1.47. Odesláno scout E.Štemberou. Envelope on/for several places worn through and torn. 1932 postcard to Czechoslovakia, franked on front side by 5 pcs of postage stmp., CDS 24.10.32, arevná postcard with lined up military. jednotou, in text about/by válečném conflict with Japan, folds in corners, viewing of quality recommended. 1947 CHINA registered air letter sent to Czechoslovakia postage on both sides 32 pieces of stamps (!) i. a. Mi.262-271 and others overprinted. Mailing postmark Shanghai 28.4.47. Envelope completely worn and glued together by official stripe. Quality should be inspected. 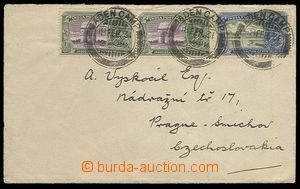 1939 commercial letter sent to Slovakia, with Mi.2x 434, CDS Baguio Apr.25.41, on reverse arrival postmark Bratislava 10.VI.41. Us German also Slovak censorship. good condition. 1938 airmail letter to Czechoslovakia, franked by multicolor franking Mi.359, 388, 361, 406, 276. CDS Manila Oct.2.1938 + cancel. Paquebot, on reverse transit Athens 18.X.38 and arrival postmark Prague 7 Abroad 24.X.38. Oblong envelope with hints post. transport. 1938 Reg and airmail letter to Czechoslovakia, franked by multicolor franking Mi.392, 394, 397, 2x 405, 361. R postmark Zamboanga City Dec.1.1938 + cancel. Par Avion Hong Kong, on reverse transit Athens 14.XII.38 and arrival postmark Prague 7 Abroad 18.XII.38. Oblong envelope with hints post. transport. 1938 Reg letter to France, with Mi.197, 117, CDS Hanoi / Tonkin 1.12.38, on reverse arrival postmark Clichy La Barenne 5.1.39. Without damage. 1937 envelope 1. flight Hong Kong - Guam, with SG.127, 128, CDS Hong Kong Air Mail/ 29AP 37 + flight cachet in black color, on reverse arrival postmark. Guam/ APR 30.1937, decorative. 1932 INDIA postcard sent from navigation Karachi - Bombay, indická stmp 2A6P, CDS Bombay Foreign/ 24.DEZ.32/ Paquebot, nice color view of ship Varela. 1944 occupation North Borneo, complete 100-stamps sheet stamp. with overprint, Mi.20 (224).